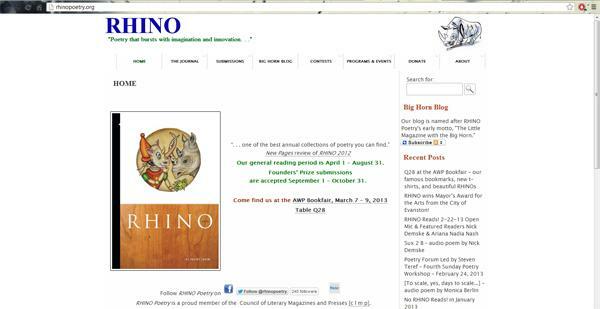 Evanston-based poetry journal RHINO recently received the 2012 Mayor's award for the arts. On a Friday afternoon, English Prof. Paul Breslin and about 10 other poetry lovers pondered a question as they sipped coffee at Evanston’s Brothers K Coffeehouse: If you were a snowman, what would your name be? Breslin was attending a poetry reading series organized by RHINO, a locally based poetry journal that has gained national and international recognition since starting as a poetry workshop in 1976. The journal recently received the 2012 Mayor’s award for the arts for its contribution to the city’s art scene. Evanston Mayor Elizabeth Tisdahl will present the award at the State of the City luncheon March 8. Ralph Hamilton, RHINO’s editor in chief, said the journal’s continuation is almost a surprise. RHINO began when a group of Evanston poetry lovers founded a grassroot poetry workshop in 1976 and published their own works. The worshop was incorporated as The Poetry Forum, Inc. two years later and began accepting outside submissions. “It shouldn’t work, but it has,” Hamilton said. Today, the organization — run entirely by volunteers — publishes an annual poetry journal that attracts 6,000 submissions from well-known poets as well as novices. The editors pick 150 entries ranging from sonnets to free verses and even language poems. The journal also features five to ten translated poems from countries including the Philippines, Vietnam, China and Poland. Hamilton said these translated poems showcase the diverse possibility of poetry and human experiences. “It just brings different voices, different experiences, different forms,” Hamilton said. RHINO also conducts poetry workshops and readings locally and in the Chicago area. In Evanston, it hosts a monthly critique session at the Evanston Public Library, and runs a poetry reading series at Brothers K Coffeehouse, where Hamilton is known for asking unconventional questions. The readings usually feature poets as well as an open mic component. 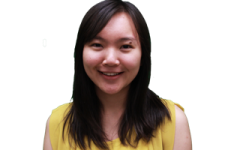 Senior editor Virginia Bell started with RHINO when she attended a workshop at the Evanston Public Library shortly after moving to the city five years ago. Bell said she was drawn to the free and open atmosphere. “It’s very democratic,” she said. Breslin, who has attended the poetry readings for about three years, agreed the atmosphere is part of the charm. Communication senior Sarah Weber interned with RHINO from February to September last year, where she attended biweekly editorial meetings and helped pick the poems. Weber said she was impressed by the editors’ passion. Hamilton said the organization was “incredibly honored and humbled” to receive the Mayor’s award for the arts. The journal’s reading period runs from April 1 to Aug. 31. It also accepts submission for the Founders’ Prize contest Sept. 1 to Oct. 31.